YES YOU CAN MAKE BREAD! I recently watched a Netflix series called Cooked. One of the episodes was devoted to making bread. It was so inspiring I decided to find a bread recipe and give bread making a try. I scored a great find on Pinterest from ItsAlwaysAutumn by searching for the easiest bread recipe. I thought worst case scenario I was going to waste some high quality flour and yeast. Possibly have a great time getting messy with my 3 year old. Life isn’t Pinterest perfect and sometimes you fail or crash hard. I’ve had plenty of burnt, messy, terrible things turn out and I sometimes shed a tear or sometimes just move on to the next item. Well, the best case scenario with this make your own bread happened, it was transformative. We all crunched into the outside buttery layer revealing a perfectly soft center. The bread had a very subtle tang like most homemade breads should. No corn syrup in sight either. My husband gently inquired of I could make 87 more loaves as soon as humanly possible. My 10 month old inhaled the homemade bread faster than my 3 year old. You don’t even need any butter or toppings on the bread when it is fresh out of the oven. 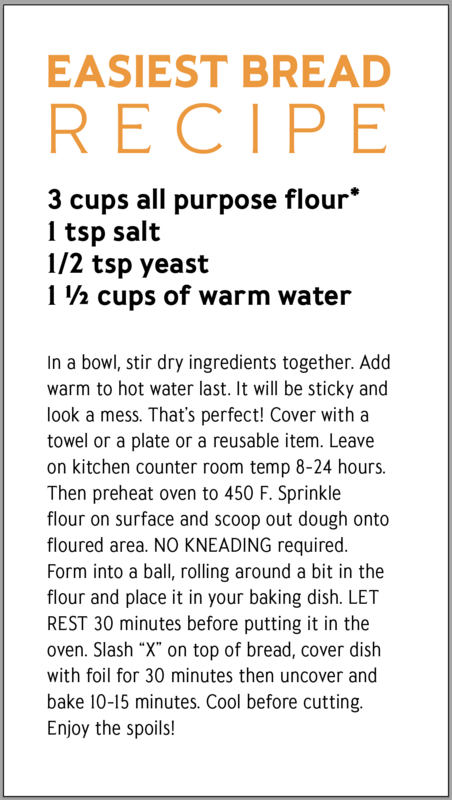 This is the easiest bread recipe I have found. My friend came over the other day and we made it for dinner. She admitted she was a bread enthusiast and had tried over 20 recipes, some being pretty complicated. She also confessed that and none rivaled this delicious bread and asked if she could take some home to her twin girls. Score and win one for the easy to make team. Please note it DOES take TIME for the yeast to do it’s job and raise the roof on the bread. 8-12 hours minimum. I typically start a batch at night and let it sit until the next day and make it for breakfast or dinner. You measure out the 4 simple ingredients and cover the bread dough and be on your way. (I try to avoid plastic since I use enough of it in our grocery products.) I would recommend to make a double batch in two separate bowls. Tips, use a to towel OR I have these silicone lids that I use all the time. Skip the plastic wrap. They create an airtight seal on any smooth-rimmed bowl, casserole, cup or glass to keep food and liquids fresh when storing. The heat-resistant, food-safe silicone also allows for quick cooking, steaming and reheating in the oven or microwave. If you use actual wheat flour, it will taste different. In a bowl, stir dry ingredients together. Add hot water last. It will be sticky and look a mess. That’s perfect! Cover with a towel or a plate or a reusable item. Leave on kitchen counter room temp 8-24 hours. Then preheat oven to 450 F. Sprinkle flour on surface and scoop out dough onto floured area. NO KNEADING required. Form into a ball, rolling around a bit in the flour and place it in your baking dish. LET REST 30 minutes before putting it in the oven. Slash “X” on top of bread, cover dish with foil for 30 minutes then uncover and bake 10-15 minutes. Cool before cutting. Enjoy the spoils! Besides being pretty quirky, I try to cook cleaner and work on graphic design when I'm not taking care of my two stellar tiny tot daughters age 3 and 1. I paint for fun, contemplate life a lot, laugh loudly, go on bike rides, and try to experience hygge. I'm far from perfect, and I'm working on being kinder both to myself and others in this world.